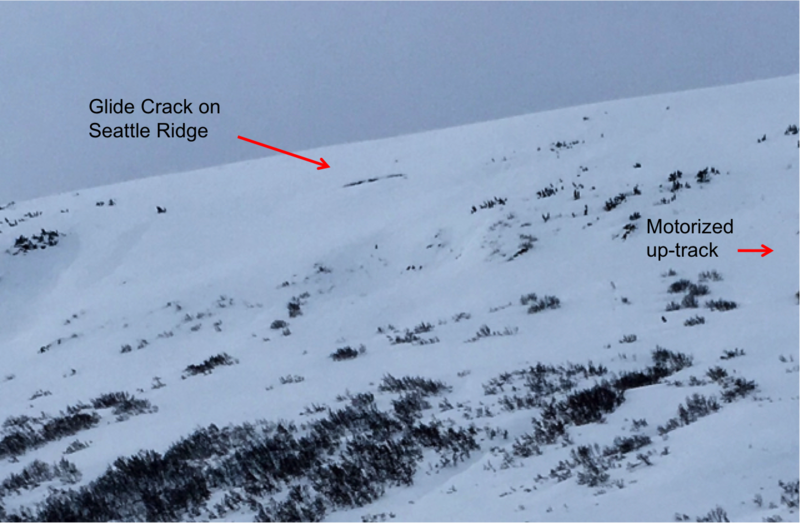 The avalanche danger is MODERATE above 1,500' on all aspects where triggering a 2-3' slab avalanche is possible on slopes steeper than 35 degrees. In addition, there are a handful of other avalanche concerns including fresh shallow wind slabs later today with an uptick in winds, cornice falls and sluffs. Also, there is a glide crack opening up on Seattle Ridge, above popular terrain just to the South of the up-track (these can release at any time without warning). Below 1,500' there is a LOW danger where triggering an avalanche is unlikely due to a snowpack consisting of hard crusts. In Summit Lake, Girdwood, and near Johnson Pass triggering a deeper more dangerous avalanche near the ground is still possible, but will be hard to trigger. Friends of the Chugach National Forest Avalanche Center is an official Pick. Click. Give. organization. When you apply for your PFD please considering supporting your public avalanche center!! Relatively calm weather has been over the region for a few days now. This has allowed for folks to push further into the mountains with no reports of avalanche activity. Unfortunately, poor snowpack structure is still a concern as a thin layer of buried surface hoar sits 2-3' below the surface. Triggering an avalanche breaking on this layer is becoming tougher by the day as the pack is taking its time in adjusting. However, the slab is large enough that the consequences could be high. The most likely place to find one of these larger slides is on steep slopes with thin areas and rock bands. Trigger points are often these thin areas, near rocks and zones that may have been scoured slightly by winds. Also, these slabs can break above you, and release after several tracks are on a slope. Be aware that snow pits and stability tests may not be representative of the actual slope you are trying to assess. A helpful way to think about this problem is to consider the consequences of a slope if it slides and identify terrain traps (gullies, cliffs, or trees below). Photo below is of a snow pit yesterday in the Seattle Creek drainage, we found the weak layer of buried surface hoar, but it was strong and took considerable force to make it fail. This is a sign the weak layer is adjusting. There are a few glide cracks opening up on Seattle Ridge. One of these is just to the South of the motorized up-track and looks like it could release any day now. Keep an eye out for these cracks and limit any exposure underneath them. Ridgetop winds are expected to increase slightly today from the South, but then shift to the NW and pick up into the moderate range later this afternoon (15-20mph averages). If the winds do ramp up later in the day, watch for fresh wind slabs to begin forming. Anytime a fresh wind slab in encountered the general rule is, expect it to be touchy. Any slabs forming today should be on the shallow side, 6" to a foot. Also, keep in mid, this NW flow is known to be channeled through Turnagain Pass in way that Southerly winds impact the East side of the highway corridor. Cornices are large, as seen in the photo below, give these an extra wide berth. Various layers of faceted snow sits at the bottom of the pack in certain areas. In the Summit Lake zone and some areas in Girdwood Valley and Johnson Pass depth hoar has been found. Similar to the problem above, these layers will be very tough to trigger, but a possibility remains in places with this structure. The more likely scenario is where an avalanche occurring in the upper layers of the pack has the potential to step down and release the entire snowpack. Overcast skies filled the region yesterday with light Southerly winds along the ridgetops. Temperatures at the upper elevations warmed up during the day into the upper 20's F and continued warming overnight into the low 30'sF. In the valley bottoms, temperatures are cooler, in the teens and low 20'sF. For today, a quick moving frontal band will bring cloud cover and chance for 1-3" of snow to favored zones. Ridgetop winds are expected to bump up into the 10mph range with strong gusts from the South then back to the NW and increase to 15-20mph this evening. Temperatures will remain mild, in the 20'sF at the upper elevations and in the low 30'sF at sea level. For the weekend, we are expecting partly cloudy skies with a chance for some snow flurries.